There’s nothing like a long, leisurely soak in a hot bath to soothe away the stresses of the day—that is, unless the condition of your bathtub is what’s stressing you out! 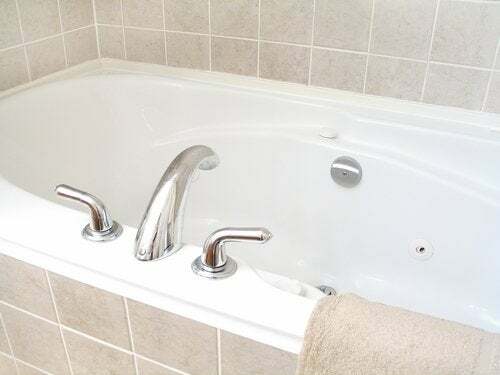 Infamously, bathtubs are magnets for soap scum, mildew, and grime, not to mention stubborn stains caused by hard water or rust. The answer for many homeowners is to opt for one of the many store-bought cleansers specially formulated for bath surfaces. Some of the more popular ones include Scrubbing Bubbles, OxiClean, Clorox Clean-Up and Clorex OxiMagic. Specifically for stain removal, Lime-A-Way and CLR Cleaner stand out as favorites. Whichever you choose, just be sure to read and follow the manufacturer’s directions for safe use, as many such products contain toxic chemicals. 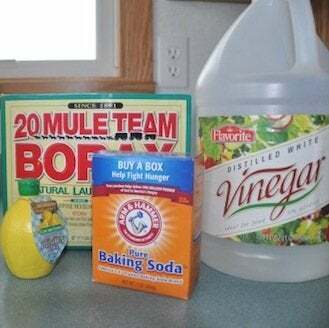 As an alternative, if you prefer natural, do-it-yourself cleaning solutions, continue now for instructions and tips on how to clean and remove stains from a bathtub, using only a handful of common, inexpensive household staples. Fill a spray bottle with a half-and-half solution of vinegar and warm water. Spray the tub surface and let the solution stand for 15 minutes. Wipe with a microfiber cloth or sponge. Rinse with clean water and wipe again. Sprinkle the tub with baking soda and spray on the vinegar-and-water solution discussed above. Let the mixture bubble for several minutes, then scrub with a soft cloth or sponge until a paste forms. Let the paste sit for 15 minutes, then wipe and rinse. Make a bathtub cleaner paste of one part hydrogen peroxide to two parts baking soda (or cream of tartar). Rub the paste on the stain and let stand for 30 minutes to one hour, then wipe and rinse. If necessary, repeat until the stain is gone. Mineral deposits look like they might never come off, but in reality, they are relatively easy to remove. Dip paper towels in full-strength white vinegar. Apply the soaked paper towels directly to the stained areas. Let stand for one to two hours. Finally, scrub with baking soda and vinegar paste (discussed above), then rinse clean. Rust stains can be treated with a paste of borax powder and lemon juice. Sprinkle the rust stains with borax. Use the cut half of a lemon to rub each stain until a paste forms. Let the paste stand for 15 to 30 minutes. Avoid using steel wool or extremely abrasive brushes and scouring powders, as these products will scratch the surface. Never mix cleaning products! Certain combinations of chemicals—chlorine bleach and ammonia, for example—can create toxic fumes or burn your skin. When using chemicals, always make sure the area is well-ventilated. Protect your skin by wearing rubber gloves. Hydrogen peroxide and bleach will discolor fabrics, so be sure to wear old clothes when using any products containing these chemicals. Wipe and rinse away cleaning products to make sure that they do not leave any residue in the tub. Ultimately, keeping your bathtub clean on an ongoing basis requires diligence and discipline. Each time you bathe, or as often as possible, try to rinse the tub surface with clean, warm water, before wiping off the excess moisture with a squeegee, microfiber cloth, or sponge. Doing so goes a long way to prevent soap scum, mildew, and grime, which makes more involved and more effortful cleaning unnecessary.